Thinking about buying a piano but can’t decide on what to get? Here we will settle the debate of upright acoustic piano vs. digital piano to help you out. So, you’ve decided to learn how to play the piano. Excellent! It’s been over three hundred and fifty years since Bartolomeo Cristofori invented the piano in Italy. Rest assured, you’ve decided to learn an instrument that has stood the test of time. 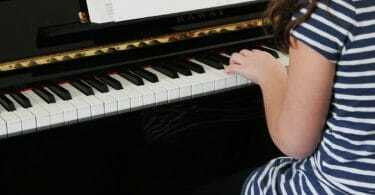 However, before you can count yourself among the pantheon of the instruments’ greatest players, you’ll need to decide which kind of piano is going to be the best to learn on. There are essentially two different kinds of piano. Acoustic and Digital. And while we may never be able to quell the Acoustic Piano vs. Digital Piano debate, we’ll touch briefly on the differences between an acoustic and a digital piano, then discuss why a digital piano, with capabilities like MIDI, recording, speakers, headphone outs, etc, is the best kind of piano to learn how to play on. An amalgamation of both a stringed and percussive instrument, an acoustic piano produces its sound by pressing keys, which in turn causes a hammer to strike strings of various lengths, thickness, and tension which vibrate to produce sound. 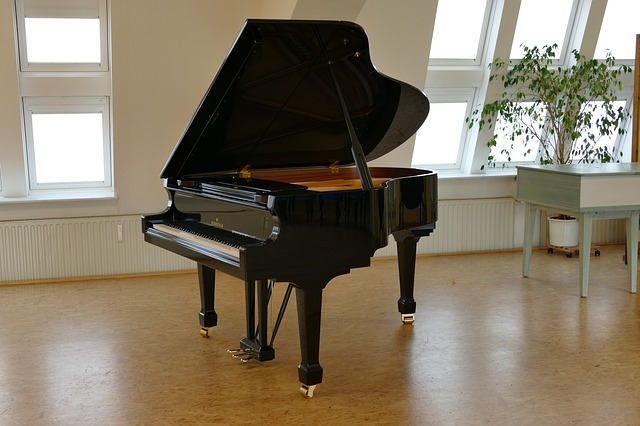 Acoustic pianos come in two basic variations, the grand piano and the upright piano. Grand pianos are horizontal, their strings parallel to the ground, and they range in size from four-and-a-half to over nine feet in length! Upright pianos are vertical. They also range in size from the spinet (36 to 39 inches), the console (38 to 42 inches), and the studio (42 inches or higher). Acoustic pianos are elaborate instruments with upwards of thousands of various parts. They are gorgeous pieces, but are generally very expensive, large, hard to move, and need to be maintained. While a traditional acoustic piano usually always has 88-keys, digital pianos range anywhere from 61 to 88 keys. Digital pianos offer the convenience of less keys, which is important if you don’t have the space for an acoustic piano in your home or on the road. Given unlimited funds, it’s entirely possible to purchase a digital piano that sounds nearly identical to an acoustic piano. However, most of us mere mortals don’t usually have access to unlimited funds, so we are left with how “close” we can get to an acoustic feel or sound, given our budget. The Yamaha Arius is considered one of the “best” digital pianos, and sits on the expensive side of the price spectrum, while the Alesis Recital offers excellent sound and functionality for hundreds less. As we’ve seen, even though the sound of digital piano might not be on par with an acoustic piano, there are numerous things digital pianos can do that acoustic pianos can’t even do in their dreams. MIDI – MIDI, or Musical Instrument Digital Interface, is a technical standard to describe an interface that connects musical instruments, computers, and various other audio devices. Able to carry up to sixteen channels of information, each of which can be routed to a separate device, MIDI offers unparalleled usability and options when utilizing a digital piano. What does this mean for you? Essentially, MIDI enables you to integrate with a myriad of devices to generate, and play, an almost limitless amount of different sounds. Your digital piano can sound like an organ, or harpsichord, or even a robot voice. MIDI provides access to a sample library as expansive as your imagination. Recording – One of the most convenient benefits of purchasing a digital piano is the ability to recording directly to the device. Save your own samples, record your own parts, loop or sequence parts to make a song. Onboard recording makes jotting down those creative bits of genius that much easier. Speakers – Unlike acoustic pianos, which use hammers to strike and vibrate strings to make sounds (the harder you depress the keys make the hammer strike harder which makes the string vibrate harder/faster which makes it louder), digital pianos use electricity to amplify sampled sounds through onboard, or external speakers. In short, this means the more amplification power you have, the louder your sound will be. It is possible, in this sense, for a digital piano to be MUCH louder than acoustic pianos, especially if the digital piano signal is run through a powerful sound system. Something to consider, especially if you plan to use your digital piano for any live applications. Aux in – Digital pianos also have the ability to accept various other forms of auxiliary inputs. 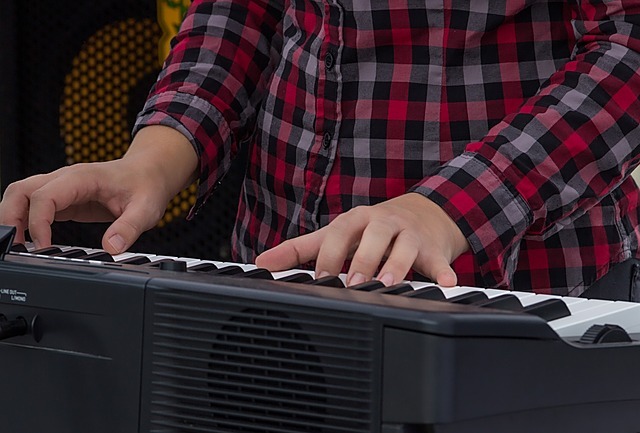 You can connect sustain pedals, trigger pads, and in-line effects pedals to make enhance and change the sounds produced by your digital piano. Headphones/silent practice – Perhaps one of the greatest benefits to owning a digital piano is the ability to practice in silence. There’s no two ways around it, if you’re playing on an acoustic piano, you’re going to make some noise. Even if you apply the slightest pressure to the keys, there is still going to be some sound generated. Someone will be able to hear you. However, with a digital piano, you can just plug in a set of headphones and play till your heart’s content, in complete silence. Feel like writing a song at 2am in the morning? No problem! Have pesky neighbors? Give them one less thing to complain about! In addition to the aforementioned Yamaha Arius, the Yamaha YPG-235 is an excellent beginner digital piano, ​complete with hundreds of sounds, presets, and built-in songs to get you going! Casio, another well-establish digital piano brand, posits their CTK-3500 as another excellent beginner’s digital piano, with “dance music modes,” 48 note polyphony, and integrated lesson system. Whichever digital piano you decide on, rest easy in knowing that you’re purchasing an instrument that is not only easy to use, but also capable of expanding as new technologies come along. Acoustic pianos may look the part, but digital pianos are chock-full of so many different functions, options, and sounds, you’d be hard pressed to pick a better piano to start learning on. Happy choosing, and best of luck as you learn to play piano!